Everest and Hillary: the mountain and the family are forever linked. On the 29th May, 1953, Sir Edmund Hillary and Tenzing Norgay made the historic first ascent of the highest mountain on earth, Mt Everest. Peter Hillary was born 18 months later. Peter grew up climbing mountains and participating in many of his father’s expeditions and projects – travelling to the North Pole, up the Ganges River in India, climbing in the Himalayas, around the United States, and helping the mountain people of Nepal. Peter’s philosophy is to live life to the full. He has led a life of high adventure since his father first took him climbing at age seven. 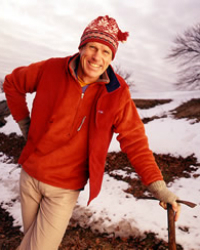 Peter is the author of four mountaineering books and one children’s book. His sixth book, In the Ghost Country, written with Melbourne jounalist John Elder, has received critical acclaim for its literary merit. Peter has been involved in numerous documentaries and films for National Geographic, PBS and Outdoor Life Network, as well as interviews for television shows including The Late Show with David Letterman, Good Morning America with Diane Sawyer, Ray Martin Up Close and Personal in Australia and the Charlie Rose Show in New York. He is the author of six books including “In the Ghost Country: A Lifetime spent on the Edge” and numerous newspaper and magazine articles, including the New York Times, and the Sydney Morning Herald. He has appeared in numerous documentaries, including the National Geographic feature, Everest: 50 Years on the Mountain. Himalayan Foundations is also part of the Hillary tradition, and in particular, giving back to the people of the Himalayas who make all Everest expeditions possible. In 1953, Sir Edmund Hillary became the first man to stand on the summit of Mt Everest, the highest point on earth. Thirty seven years later, his son Peter also stood on the summit. In this presentation, Peter Hillary shares what it took to get the first father and son to the top of the world. His 10 Steps include hilarious and spine-tingling anecdotes about his climb that will transport your audience to another world. Most importantly however, it will leave your people with a “can-do” attitude to achieving goals in their own lives. Your survival is enhanced and your life enriched by the other dimensions in your life – the people you love; the other ambitions you have. If there is only one thing that matters to you in your life, you run the risk of having nothing else to live for if you lose it. A 15 year quest that took Peter Hillary to the North Pole, the South Pole, and the summit of Mt Everest: the Dream, the Drive, and the Dedication to the Goal. This trilogy took 15 years to complete. It is a testimony to the value of perseverance and to Peter’s dedication to a life of adventure. He and his father, Sir Edmund Hillary, are the first father and son to have climbed Mt Everest and to have established new routes across Antarctica to the South Pole. For the North Pole they travelled together with astronaut, Neil Armstrong , using small ski-equipped aircraft. “To the Ends of the Earth” is a presentation which takes the audience to some of the most extraordinary, the most hostile, and the most hauntingly beautiful places on the planet. It shares the true spirit of adventure and encourages us to utilise the positivity and freshness of that spirit in every aspect of our lives. In these challenging times, the one thing we can be certain of is change! Learning to adjust and adapt to the challenge of a constantly changing outlook is an essential skill of a mountaineer. This presentation addresses the challenge of change and looks at the attributes and attitudes required to deal with it. Peter’s speech is a series of amazing stories from Himalayan mountaineering expeditions to polar journeys in Antarctica which illustrate how change is often inevitable and it is your ability to cope with it that is the critical factor. We must learn to refocus on a new or changed objective when the situation changes, we need to learn to effect change and we need to revel in the experience! It is your enthusiasm and your adaptability that gets you through the challenge of change … with a smile on your face! • Revelling in & thriving with change.